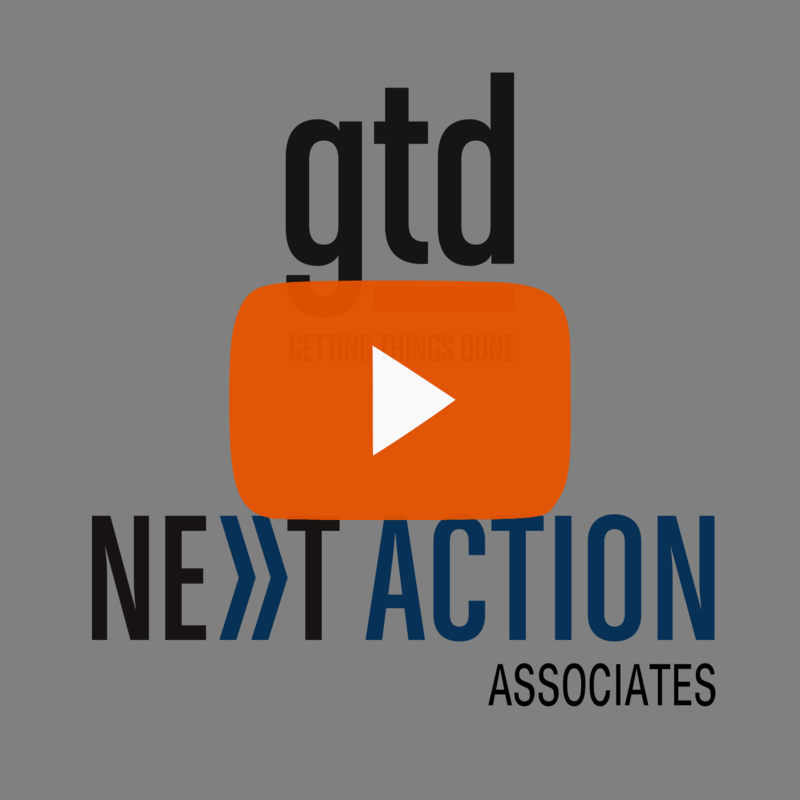 In this episode, Todd Brown and Robert Peake talk about how GTD® can help to mitigate overwhelm and restore a sense of positive, calm focus to your work and life. 00:05 Todd Brown: Hello everyone and welcome to another Change Your Game with GTD podcast. I’m Todd Brown and I’m here with Robert Peake. 00:13 TB: Our goal in this podcast is to support you in helping to realise the benefits of the Getting Things Done® methodology, stress free productivity and keeping your head clear, ensuring that you’re focused on the right things. And Robert, as you and I were talking about what we might talk about today, it sort of came as a surprise I think to both of us that we haven’t addressed a topic which is pretty fundamental, I think, in terms of the motivator that brings a lot of people to our work, namely that they feel quite overwhelmed by things, by workload, by the number of distractions they have, by just generally the volume of their life. So we thought we’d talk today about that, about overwhelm, maybe diagnosing it, and certainly what we can do to help by way of GTD. What’s your experience been? Was that something that brought you to the methodology in the first place or what’s your history with overwhelm? 01:09 RP: Absolutely, yeah. The aha moment I think, as I’ve said, for me in the GTD seminar was the mind-sweep. It was that realisation that I just had stacks and stacks of stuff that had been in my head and how powerful it was to see it externalised for a moment in time, that it suddenly wasn’t all in my head, that I suddenly wasn’t worried that I was gonna forget something. And I think a lot of the challenge with overwhelm or a lot of, I think, where the stress and anxiety comes in having so much to do, is in that sense that there’s so much to do, not all of it can necessarily be done. Am I focused on the right things because it’s possible I’m missing something. It’s possible in the midst of all this to-do that there might even be something else lurking out there that I’ve forgotten about in the moment, because I’m trying to use my head to manage and track and retain all of those things that need to get done. So for me, that definitely is one thing that brought me to the methodology. It was a real mix of the stuff I had chosen to do via work or study or these kind of formal paths called… These are commitments you take on, ’cause you have a job, and the overwhelm of wanting to do lots of things, wanting in a way to live a rich life, have hobbies, have other interests outside of the kind of typical work structure. 02:54 RP: So ironically, sometimes it’s that wanting to have a lot in life, wanting to have a rich life, wanting happiness and engagement that can lead to just the opposite, that sense of overwhelm, if you don’t have a good system to manage all that. So I see a lot of overwhelm with clients. It’s interesting sometimes how much people need this work, and how sometimes difficult it is to schedule and get things set up to actually go in and be able to support them, because of the overwhelm factor, right? Our clients are people often who really need this. What about you, in terms of your own experience, experience of clients who’ve been in a state of overwhelm? What’s that been like and how have you supported yourself and others through that path? 03:46 TB: Yeah. I think that for me, at the beginning, one of the big attractions of Getting Things Done was this kind of promise that life didn’t have to be about being overwhelmed, right? I think there was, in the corporate environment that I was working in at the time that I got exposed to GTD, being overwhelmed was worn as a bit of a badge of honor, right? “I’ve got way too much email. I’m in so much demand. I’m back-to-back booked in my calendar. I must be a really important person.” And so there was this kind of bizarre feedback loop that rewarded that kind of behaviour and therefore led to people, in some slightly twisted way, to aspiring to that. And just to be clear, that’s not about… I think what they were sort of kidding themselves about was that that was a productive way to live. In other words, being overwhelmed was the way we get to be… The way we get more done and the way that we get the boss to notice, and the way that we get promoted and all that. 04:55 TB: And so, it’s something that I noticed myself, and it’s something I’m reflecting on a coaching that I did once with someone very senior in one of the firms here in London who said the same thing. She said that the most important thing for her about GTD was that she recognised not just that there was an alternative to that, but that she also recognised that living that way, living in a state of constant overwhelm, not trusting your choices, having the sense that you’re over-booked, over-committed, not just that that was uncomfortable in some sense, it was overwhelming, but also that it was a less productive way to live, right? ‘Cause you were getting more of the wrong things done, probably over-reacting to things or under-reacting to things. 05:42 TB: And so that really appealed to me right from the beginning. It was one of the things that kept me going in my first couple of weeks and months of my GTD practice, was that kind of promise of, “Yeah, the world doesn’t need to be this way.” And not just that, again, back to the point, it’s not about getting to the point where you’re completely stress-free because you’re doing nothing, right? It’s getting to the point where you’re completely stress-free and you’re getting more done than you ever have gotten done in your life, and more of the right things. So it’s about both efficiency and effectiveness, as it were, that have been maximized. So yeah, it definitely was one of the early sense that I had was that Getting Things Done would be attractive for that reason, number one, and yeah, over the years, it’s one of the things I think an awful lot of clients… Because so many people are so overwhelmed by so many things these days and that’s, I suppose, one of the reasons that our work continues to be so resonant and people are drawn to it. 09:06 TB: It’s funny, I think in some ways it is the most important promise of the work for so many people. Stress levels, you can just open your newspaper and look at stress levels, look at the fact… And what I think is interesting, and I think we touched on this in one of our last podcasts, was there seems to be this idea out there in the world, I think the phrase we used was, “rise and grind”, right? There’s this new sort of tendency among certain people to say, “Look, basically you should never have downtime, and you should always be doing something productive.” And in that population, as far as I can tell, again, stress levels are valued, and if you’ve got a high stress that’s a good thing, and living in questionably sustainable ways. 09:57 TB: And I think, again, what GTD kind of offers is this surprising realisation that you can be less stressed, more clear-headed, more confident about the choices that you’re making, about what to focus on and get loads more done, right? And that I think for the people who get it… Some people believe that’s not possible, right? So we need to start there and they’re gonna say, “That’s not… Surely that can’t be on offer.” But I think for the people who get that, that’s why they’re drawn to this and that’s why they choose to do GTD, to learn about it, to refine their practices, to refine their systems, because that’s the promise, and it’s an attractive promise, right? So let’s get a little bit more practical. So if people are feeling overwhelmed, let’s just spin some ideas about what can they do to help with that? 10:56 RP: Yeah, great, I mean, well, the first thing that comes to mind is going back to that original aha moment of the mind-sweep. We often say in the seminar, and it was certainly my experience, there’s a mix of kinda grief and relief at realising how much there is out there. So the relief comes from it no longer being in your head. So just externalising a crude list, an incomplete list of not yet clarified stuff can help a lot of people, but there is then also that kind of grief of going, “Wow, some of these are potentially missed commitments. Some of these are things that I look at it and I start to hyper-ventilate a little bit.” So you’re not quite there yet, just in the capture phase, I think. 11:42 RP: So when you get to clarifying and organising, when you get to creating a comprehensive list of your projects, for example, a comprehensive list of all the outcomes that you’ve committed to achieve, not the someday maybes, not the stuff that would be nice, but this is really on my plate, here it is, this is the plate, I think some people can have a bit of indigestion, to carry on the metaphor, just looking at how much is there. But we have some ways to work with that too. So Todd, when you’re working with clients and they go, “Wow, maybe I’m afraid to create a comprehensive project list, or when I look at this project list that I’ve created that feels comprehensive, I still feel some overwhelm.” How do you help them deal with that and navigate that, ’cause there is light at the end of that tunnel, right? There is something good there. But there’s some stages along the way, I think, where you may get momentary relief, and then go back into overwhelm. So how do you help with that? 12:43 TB: Yeah, I think it’s a really good point, and I think there are some tactical things you can talk about, and I think there’s some… And encourage clients to do, and I think there are also some… That there’s something also about a mindset. So, encouraging a certain mindset about the way that you think when you engage with your projects list. So the first thing, and this just goes to tactics, is have I… If I look at a client’s projects list, do I see clear outcomes? Do I see intended finish lines? This is the way this looks if it’s done. The second thing I’d probably look at is do the finish lines that they’ve defined, the projects that they’ve defined, do they have any kind of emotional component at all, because to the extent that they have an emotional component, they are more likely to be attractive, and then more likely to encourage us to engage with them, right? So that’s so much subtler thing, but it’s something that I’d be looking for. 13:39 TB: And then when it comes to the mindset shift, I think, and this is something that’s been necessary for me I think before we pressed record on our podcast today, one of the things that I was telling you about was David Allen was in town yesterday, was in London here and dropped into a seminar that we were doing, and David was talking about the fact that when you engage with your projects list, what he was saying was you engage with your projects list in a way that you see all of those things as being done. You view them as if they were done, and that generates, mentally, it generates a motivation certainly, but it also generates then thinking about, “Okay, well, I’m not done yet, right? But if I wanna be done, what’s relevant that’ll get me from where I am now to there?” And so he was saying that that’s kind of the mindset shift that a lot of people need to bring to their projects list. And it’s something that I find myself, to your point about feeling a bit overwhelmed by my projects list, and I do sometimes, right? And I just have to remind myself that it’s… If I think about the function of my projects list within my life, it’s about, it’s the biggest perspective aid I have in some ways, right? It’s helping me to make sure that I have good balance between all of the things that I’m focusing on, that the projects, these bigger outcomes, are getting enough attention from me and they’re not getting neglected. 15:12 TB: So I try to keep that in mind whenever I have this sort of sense that, “Oh my gosh, that’s quite big and that’s quite… That feels a bit threatening and it feels… ” whatever. I try to remind myself that the review of the projects list has that kind of benefit. But at the same time, I think we need to make space for the fact that, and we say this often in the work, GTD is not for the faint of heart, you will come face-to-face with all of your commitments, whether they are… Whether it’s that really tiny niggly thing that you’ve had on your mind for six months and have done nothing about and it’s been generating a bit of low-level mental stress, or whether it’s that big project which feels quite daunting in some ways as you define it. But again, ultimately, codifying it as a project, documenting it, making sure it’s some place in your system that you’ll review that project regularly is going to increase the chances that it happens, and increase your motivation to do it if it’s codified in the right way, if it’s defined in the right way. So yeah, again, that’s a bit of an admission that there’s a bit of yin and yang for me I suppose in the projects list. I don’t know, what’s your experience? 17:38 RP: And so, as you said, by externalising, yes, it’s not for the faint of heart, but it gives you a chance to look honestly at, “If I want at this stage in my life to spend some time with family or have some breathing room or do other things or to just get on my bicycle and go for a ride once in a while, is this reasonable? Have I taken on more than one human being in one lifetime should be expected to do?” So it lets you get objective, for some people potentially for the first time maybe in their lives, about what you’ve committed to, about what the kind of volume is, and then look at your standards. It’s like, well, do you wanna do all of that and do you wanna do all of that fast, and do you wanna do all of that accurately and not let anything drop and slip through? It’s like, well, good luck, good luck. Being comprehensive and also doing it rapidly and also doing it to a high standard of quality isn’t necessarily also reasonable as well. So it’s like, well, do you want a kind of faster jotty or do you want to take on fewer things and to do it to a better standard of quality, or what do you want? How does this match up with your value system, with kinda how you’re wired? 19:01 RP: But those are decisions ultimately you do have to make. GTD isn’t gonna tell you, “Go through your system and cut out all the projects that start with the letter P.” There’s not some arbitrary way of doing this. It will hold up a really good mirror. You can finally get a good look and go, “Oh wow, yeah, there’s a little something here,” or, “This really isn’t appropriate. I need to find a way to restructure, renegotiate, or just admit, “Look, my life is about work right now, that’s fine, that’s what I’ve taken on, and I need to be at peace with the fact that, yeah, if I wanna say yes to all this and do this, it’s gonna be 10:00 PM quitting time most days and most Saturdays as well.” So it’s an opportunity. It’s an opportunity to decide how important it is to not be overwhelmed, and what you’re willing to potentially give up in order to do… But it’s a conscious decision, right? It’s, “What am I willing to give up that’s really something that I am willing to give up, rather than what I’m doing now, which is just letting a bunch of stuff kinda slip through the cracks as a way to manage the overwhelm?” Which, as we know, just creates more overwhelm. 20:19 TB: So okay, so if we think some more about sort of practical tips, you’ve talked about the importance of externalising things. You’ve talked about the importance of review. We’ve talked a little bit about how we recommend that people interact with their systems, how they kind of think about interacting with the inventories, with the list they’ve created. Talked about being realistic about what is the set of things that I’ve committed to? And I’m with you there completely. I’ve had in many client engagements situations where people have just, by externalising and being really clear about the inventory of their commitments, they’ve come to the same conclusion that your client came to, which is this is just not doable, it’s not sustainable. And I think the other thing that’s important about what you said is, you said at the end there, some people will choose to say, “Hey, right now my life is about work and that is it.” I’m reminded of an interview I read with someone back in the dot-com days, back when the dot-com boom was going on, and he talked about, he talked about his friends and his family not in some sort of a valuable way, but as being drag coefficients, that they were getting in the way of him [chuckle] doing the things that he wanted to do. 21:45 TB: And again, what I think, what we wanna say here is that if you want to be as near as possible, 100% on being a productive employee or a productive entrepreneur or a productive whatever, whatever it is that work looks like for you, we got lots to offer, right? GTD is not about, as we said before, it’s not about sitting in the lotus position and meditating about all the things you could be doing. It’s about getting a lot done, and it’s really just about being conscious and making choices, as you said, about where to focus. 23:32 TB: Good stuff. So Robert, here we go, top tips. So someone comes to you and they say they’re overwhelmed. You got 30 seconds to give them some advice. What’s your advice? 23:48 RP: Get it out of your head. That’s gonna start helping. Then get it clarified and organised into into projects and actions. If that’s not enough, as you start reviewing it, start looking up the higher horizons. Look at your areas of focus. Are you giving appropriate attention via your projects to those different areas that matter for you, in terms of work and home and so forth? So basically start marching up the horizons focus. Start with the capture, and then as you clarify and organise at the basic levels, that’s gonna help too. And eventually at some point, if you’re a really high-volume person, that’s not gonna be enough, keep marching up the levels, basically, to have a look at that horizons focus model, clarify from bottom to top, and see if that doesn’t give you greater and greater relief as you work the process. What about you Todd? Elevator pitch for overwhelm? 24:36 TB: I was gonna say that you’ve really hit an awful lot of the high things I would hit. I think the other thing I would add is just it goes back to this mindset question we were talking about earlier. Review your system regularly. Try to make sure that you’re not letting… The longer time goes by between reviews of your system, the less you’re gonna trust it, the more it becomes this kind of a source of stress, frankly, a place where things are sitting that you know you should be engaged with but you’re not engaging with. So make sure that you’re reviewing frequently. And just keep in mind that as you’ve been creating the content in your system, as you’ve been clarifying and organising and creating next actions and projects and doing all that work, that what you’re really trying to do is be supportive of your future self, right? So when you look at your system, and I try this one sometimes as well, I just say a little moment of thanks to my past self who has done all that good work that then sets me up to be as clear-headed, as focused and as productive as I can be in the current moment. 25:44 RP: I love that idea of thanking your past self. Think about your future self, but remember it was your good old past self that did the good hard work of clarifying that got you here. That’s great and I like that. Try that out. 25:57 TB: Great stuff. Well, thank you all. Thank you for being with us today in the Change Your Game with GTD podcast. As always, if there is anything we can do to be of support to you, please get in touch with us. You can find us on the web at www.next-action.eu. Also, if you have any topics that you’d like to hear us discuss, some of our best podcasts have been listener suggested topics, so please do get in touch and let us know about those as well. From me and from Robert, have a great weekend, and we look forward to seeing you next time.